The A12000 Terrafirma 12000lbs Winch with Synthetic Rope is fantastic value; we use one every day on our trailer. The Terrafirma A12000 winch incorporates all the features requested by commercial users, as well as recreational & competition off roaders. The new Terrafirma winch combines 12000lb of pulling performance and modern styling with high quality synthetic rope and wireless remote control as well as the standard cable remote. A powerful 6hp 12v motor and low noise 3 stage planetary gearbox produces 12000lbs of power pulled through a silver-grey synthetic rope and rated safety hook, of course with the synthetic rope comes a cool black alloy hawse fairlead. The winch is designed with a modern look and finished in stealthy matt black with matching compact solenoid pack with 2 green LEDs to indicate ‘winch live’ and ready for work. The solenoid pack has the added benefit of being able to be mounted in multiple mounting positions. 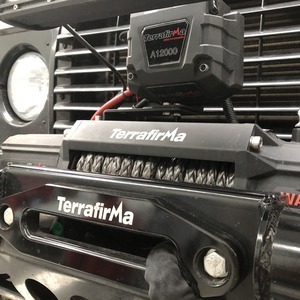 The Terrafirma A12000 winch is built on the standard frame size of 10×4.5” to allow fitment to most popular mounts and bumpers.